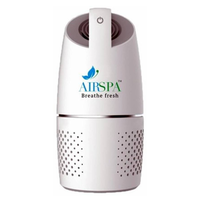 Buy the Sharp Plasmacluster Air Purifier for Cars IG-GC2E for fresh, clean smelling interiors and to keep the air you breathe free of airborne allergens, viruses, microbes and mould. The best part about the IG-GC2E is its unique shape - it fits into most cup and bottle holders that most modern cars, vans & SUVs come with. The IG-GC2E features twin-air suction and is equipped with PM10 filters to trap tiny dust particles and pollen. It also has a Turbo mode for quick de-odourisation. Noise levels are ultra-low at just 23 dB in standard mode and 36 dB in Turbo mode. The unit takes power from your vehicle's DC 12V cigarette lighter port. A dual-port USB charger is standard accessory - you can charge your smartphone too. The IG-GC2E has no recurring costs towards replacement of filters. The unit has a life of 19,000 hours (that's nearly 8 years at 6 hours of use everyday). Sharp's IG-GC2E is available in two smart colours to go with your car's interiors - Metallic Black & Champagne Gold. 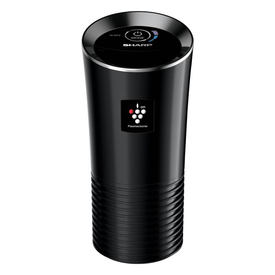 Buy the Sharp Plasmacluster Air Purifier for Cars IG-GC2E for fresh, clean smelling interiors and to keep the air you breathe free of airborne allergens, viruses, microbes and mould. The best part about the IG-GC2E is its unique shape - it fits into most cup and bottle holders that most modern cars, vans & SUVs come with. The IG-GC2E features twin-air suction and is equipped with PM10 filters to trap tiny dust particles and pollen. It also has a Turbo mode for quick de-odourisation. Noise levels are ultra-low at just 23 dB in standard mode and 36 dB in Turbo mode. The unit takes power from your vehicle's DC 12V cigarette lighter port. A dual-port USB charger is standard accessory - you can charge your smartphone too. The IG-GC2E has no recurring costs towards replacement of filters. The unit has a life of 19,000 hours (that's nearly 8 years at 6 hours of use everyday). Sharp's IG-GC2E is available in two smart colours to go with your car's interiors - Metallic Black & Champagne Gold.